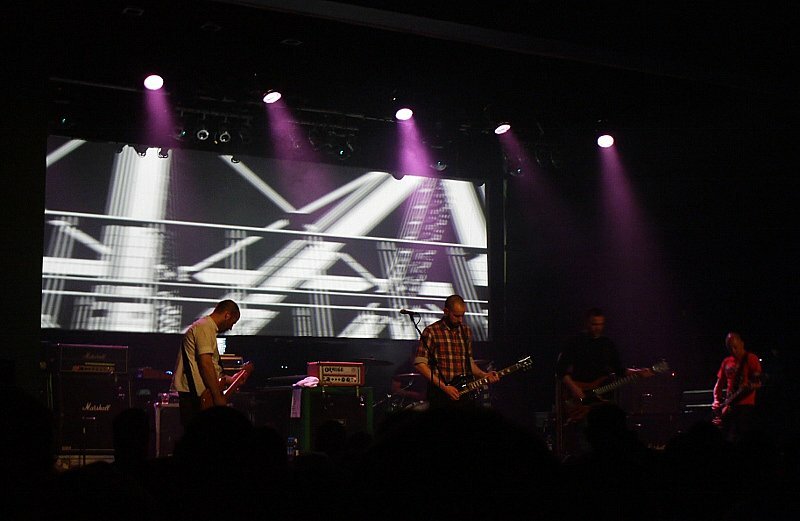 I was at the De La Warr Pavilion on Friday to watch Glaswegian post-rockers Mogwai. 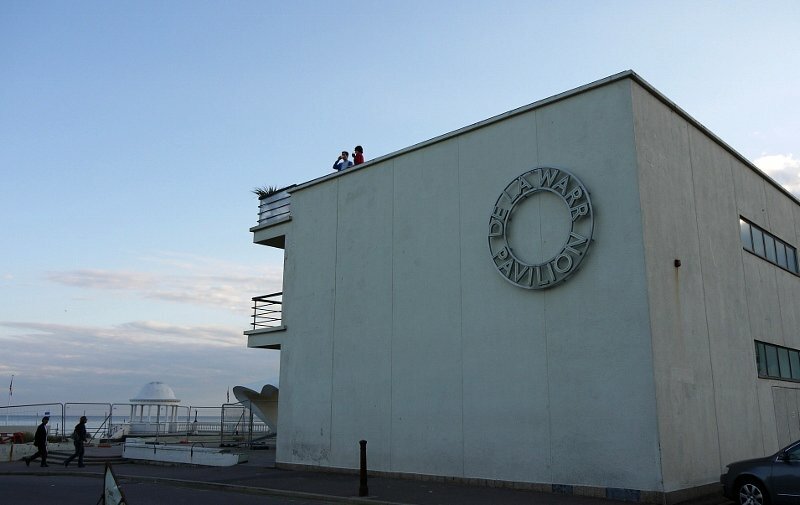 Friday evenings in Bexhill are a blast, the main attractions range from tripping over old dears driving their yappy little dogs on the seafront, window shopping the dozens of charity shops, and elbowing your way to the bar in various end-of-the-line pubs, full of aging alkys and thirsty brickies. 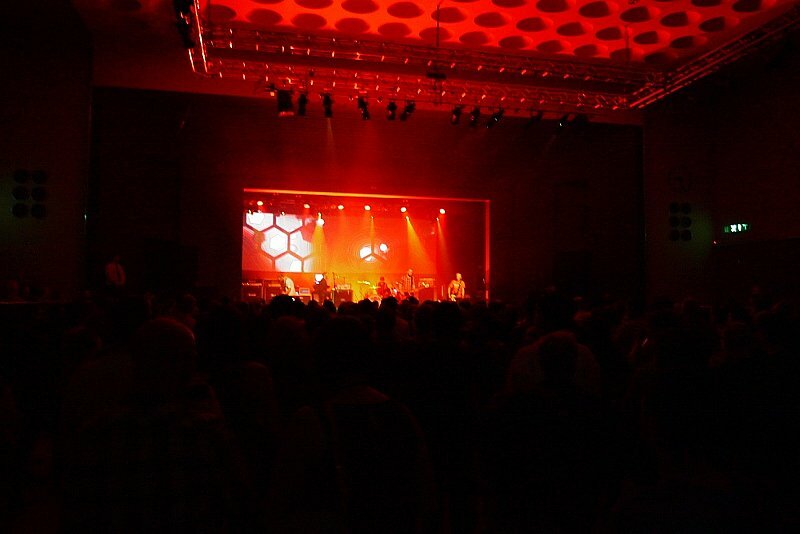 Don’t get me wrong, there’s a melancholic attractiveness to the place, but Bexhill puts the sleep in sleepy, and for all these reasons it’s the perfect setting for a Mogwai gig. 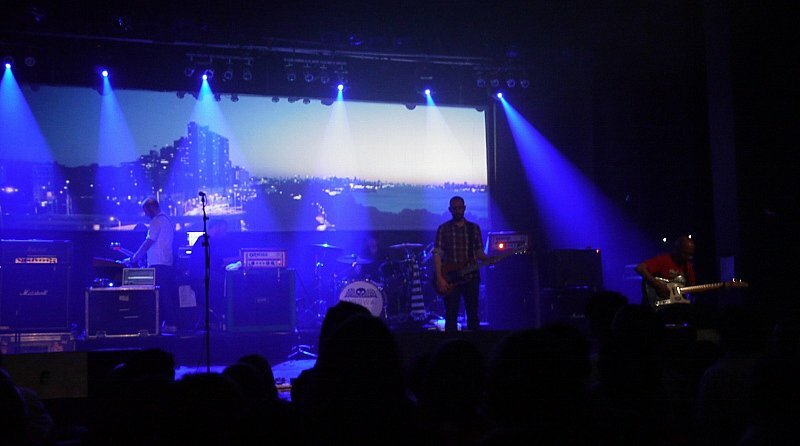 Mogwai don’t sing much, and their fans ‘sway’ in the area where a mosh-pit would be for more ‘lively’ acts, so they’re more of an acquired taste. I got told to “Ssssh, do you mind?” by one disciple, for the crime of talking over yet another quiet/slow period during one of their quiet/slow/fast/loud tunes. 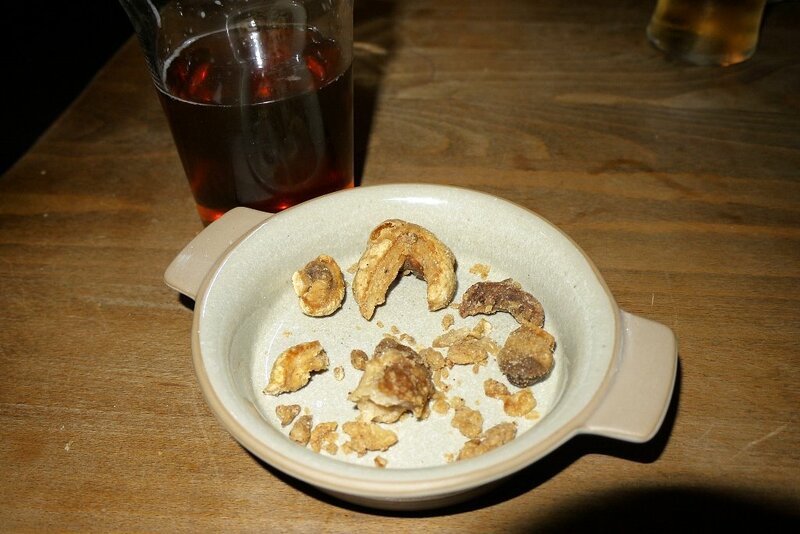 I’ve been gigging since the 1980s, I’ve never been told to keep it down before, hilarious. The gig itself was oddly uplifting, but I think this group of extremely gifted musicians would be lost as a live act without their video backdrops, of which my camerawork doesn’t do justice; some of them were achingly beautiful, if sombre, but a perfect foil for the music. 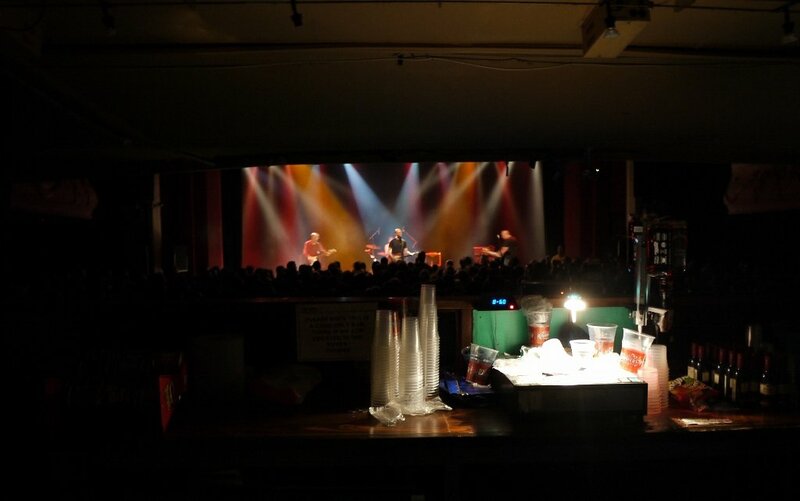 It was a good gig, the pavilion is a great venue acoustically, and Mogwai are worth seeing, just don’t expect to leave the venue tired and drenched in sweat. 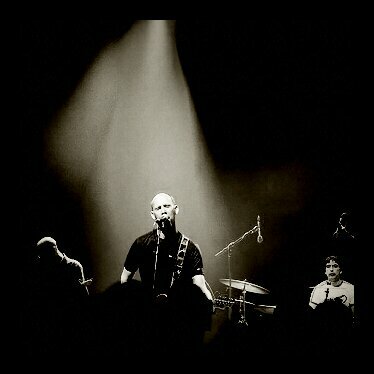 Recovery time today, I was at the Half Man Half Biscuit gig up at the Shepherd’s Bush Empire last night. 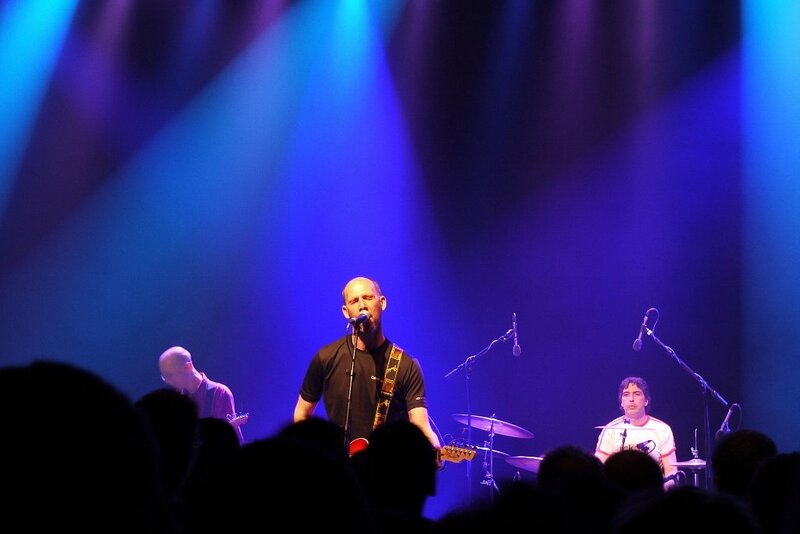 They’re still one of the best live bands in the UK, older than most (“…avoiding proper work since 1985″), but bald pates aside the boys from the Wirral have not lost it. The Empire was rammed to the rafters with beer bellies swathed in Dukla Prague away kits, the beer was flowing faster than the torrential rain outside, and I wouldn’t have it any other way. 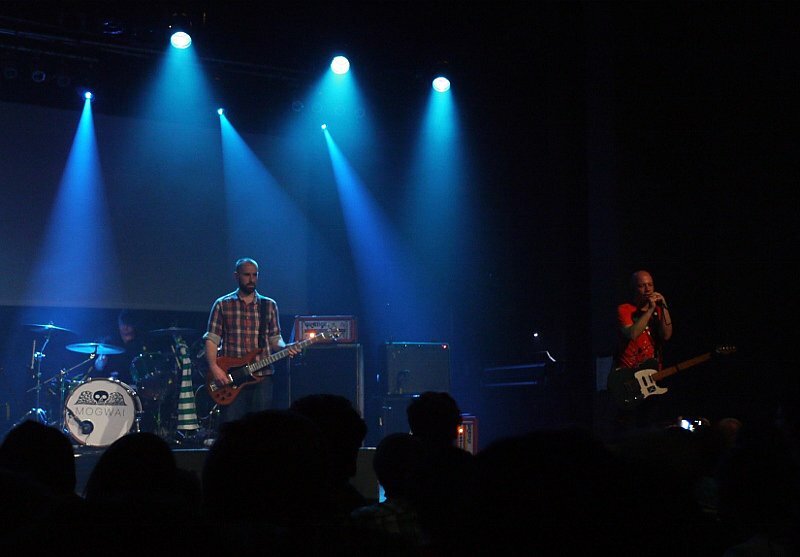 If you still haven’t seen HMHB live, you simply haven’t lived. It’s shameless plug time here at Hovian Towers. 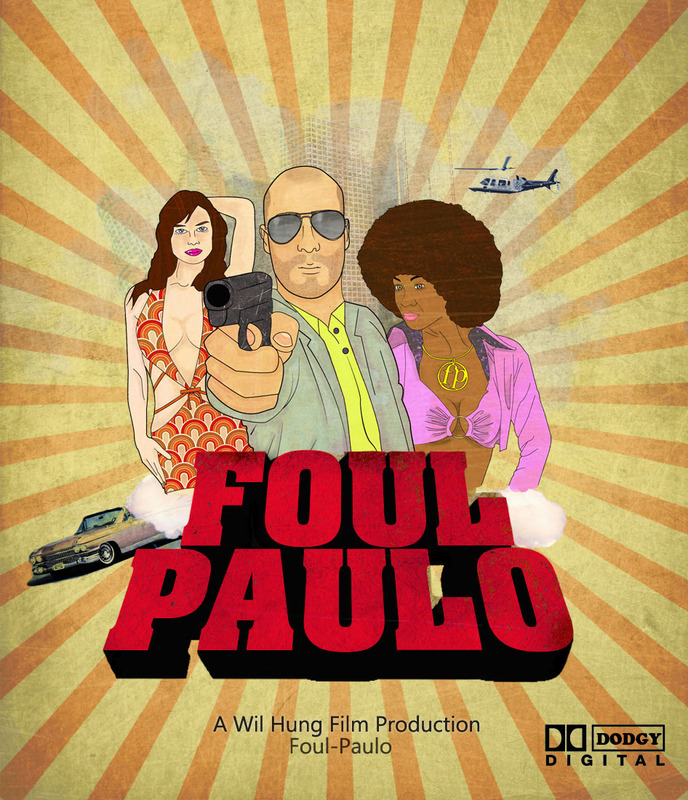 Foul Paulo is a very good pal of mine from Stirling in Scotland; apart from being well into his football and good clothing, he’s also a very accomplished musical artist. 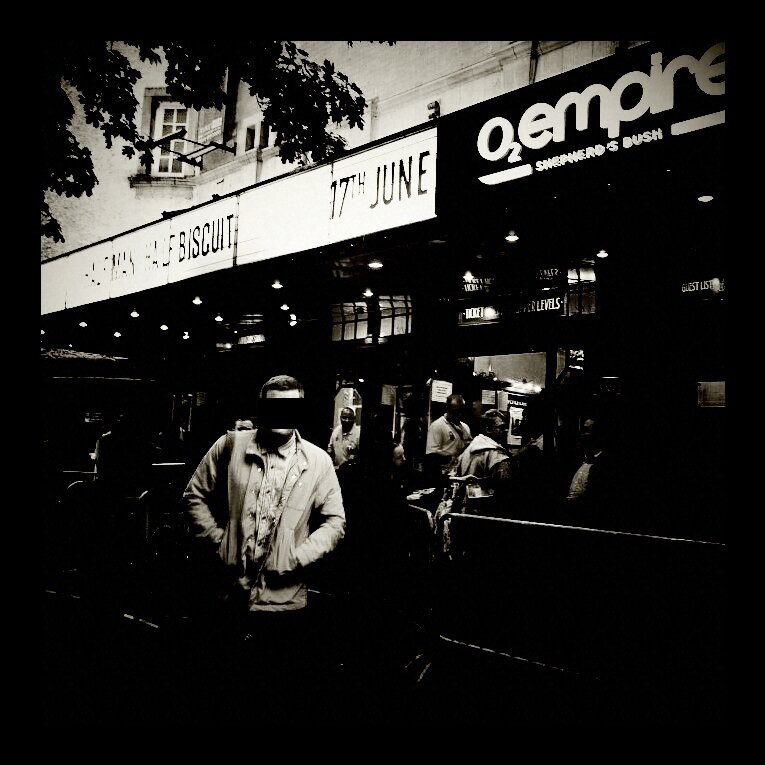 Paulo’s been making music since the early noughties, and his signature style is chopping up and sampling vinyl, taking inspiration from such wide ranging artists as Daft Punk, DJ Premier and The RZA. But it was hearing the freaked out sounds of Timbaland in the 1990s that first got him hooked and wanting to make some beats of his own. At present Paulo is currently working on projects with other musicians in both the USA and UK, and is trying to get his stuff out there and make a big footprint in the UK electronic scene. I’ve heard his stuff and love it, so without further ado, please click on his SoundCloud link, where you can get FREE downloads of Paulo’s latest tunes. When you’ve done that, like his Facebook page, and follow him on both Twitter and YouTube. At the minute Paulo’s just happy to get his music out there, but some time in the future there should be commercial releases, that’s why I’m helping to raise his profile, because he’s a nice guy, not just a talented one. So, if you like it, play it and tell people about it, he’s definitely my sound of the coming summer. 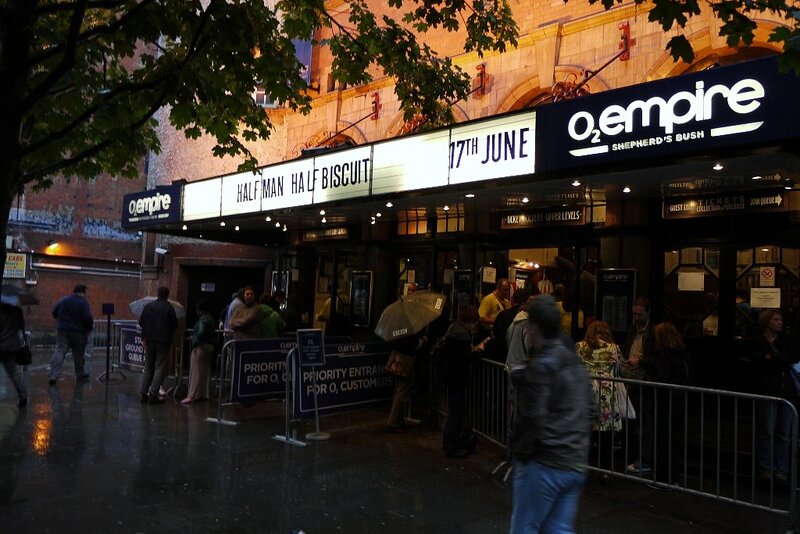 …love to see Half Man Half Biscuit in the Shepherd’s Bush Empire. 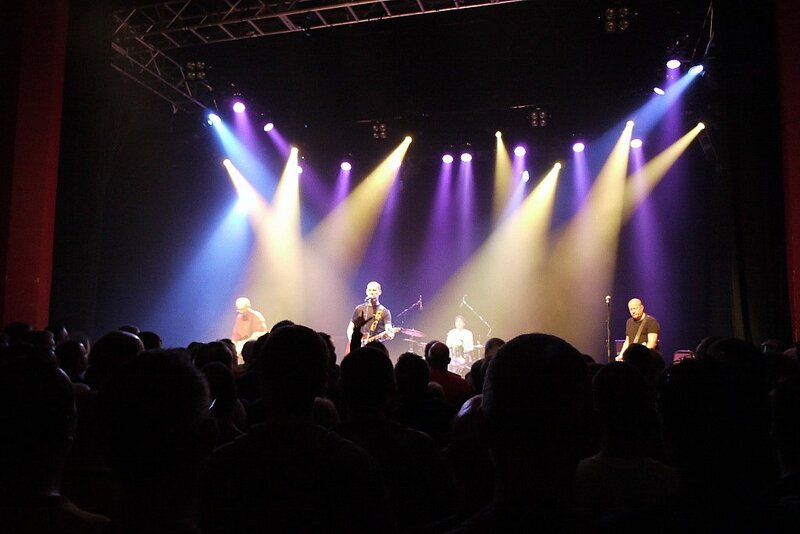 The legendary Half Man Half Biscuit are on stage up in old man Steptoe’s old haunting ground on Friday 17th June. I’ve always been a big fan of the four lads from the Wirral, they are as unique in their own way as The Fall are in theirs, albeit with a more folksy and humourous take on life. I’m taking the other half up as a first time treat, whether she chooses to bop along with 50-odd overweight and profusely sweating 40-somethings at the front is entirely up to her. 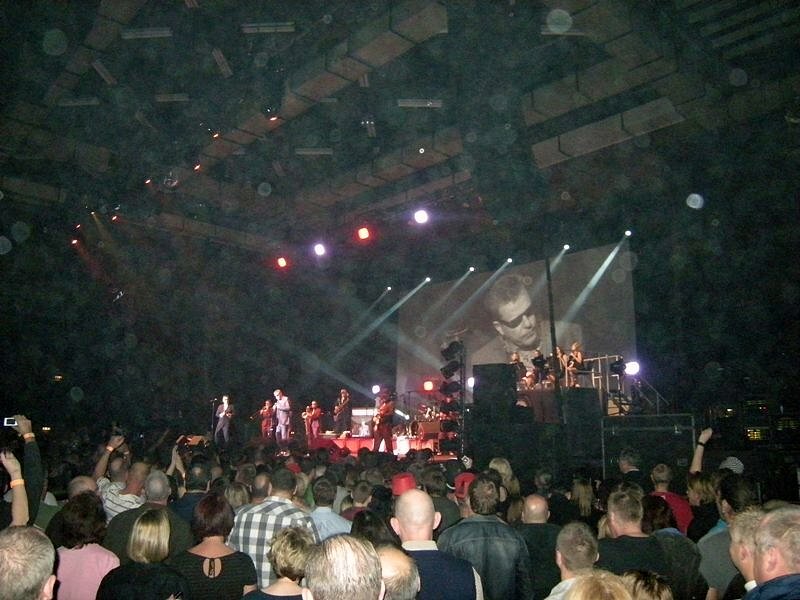 I went to the Brighton Centre last night to watch Madness, supported by Paul Heaton. 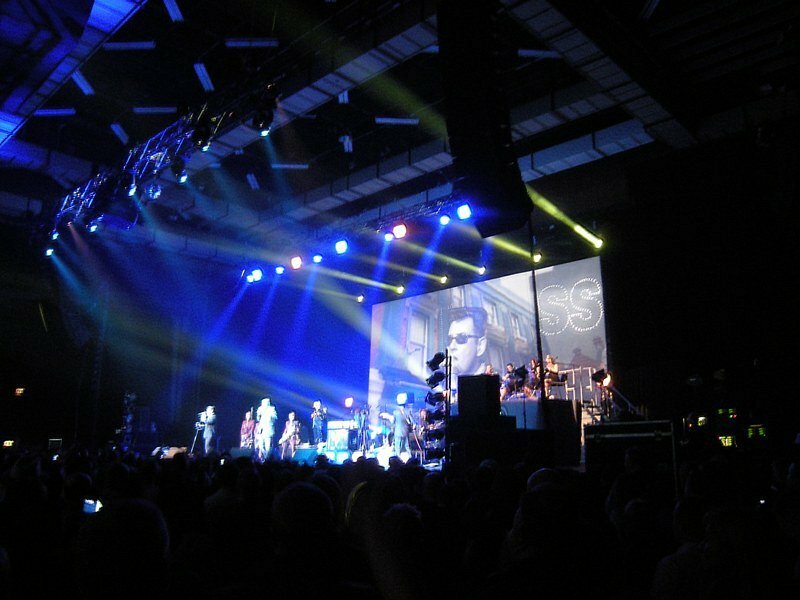 It was a great gig, Heaton’s voice is as sweet as ever, and the nutty boys are still great fun. 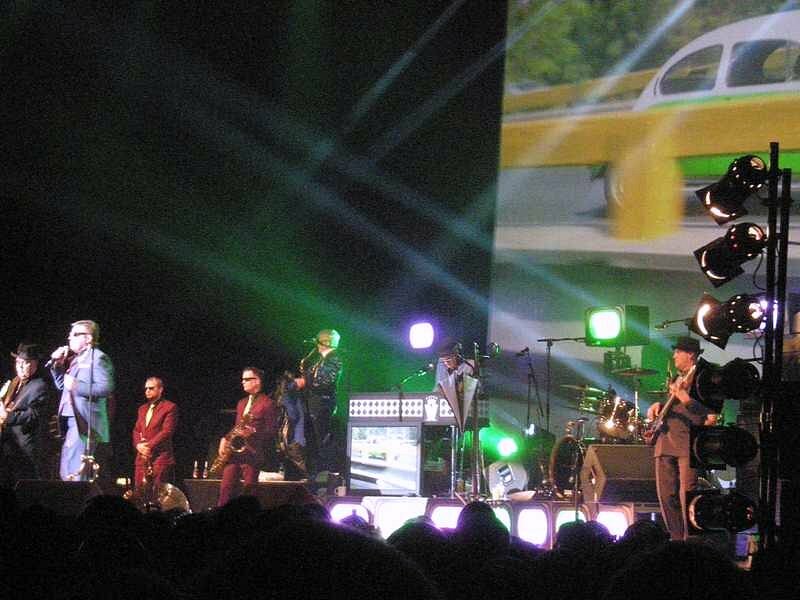 The hall was full of superannuated skins and ska-boys, all singing and dancing. Here’s a few shots I took on my pretty awful Nikon compact, I should have taken the Lumix instead, hey ho. This morning I’m off to the gym to throw a few weights around, I’m in a bit of a bad mood, so the best thing to listen to is, oddly enough, The Fall. Not many people would think of The Fall as gym iPod music, but I find Mark E Smith’s mysanthropic howl the perfect accompaniment to an angry weights session. I got into The Fall late, around 1996, it coincided with my first year at university, and I took to them with the full weight of cod-angst that seems to inflict all those who initially take up full-time education. Yes, I was a student bellend. But, since then, I have grown to love MES and his ever-changing line-up of musicians with all my heart. 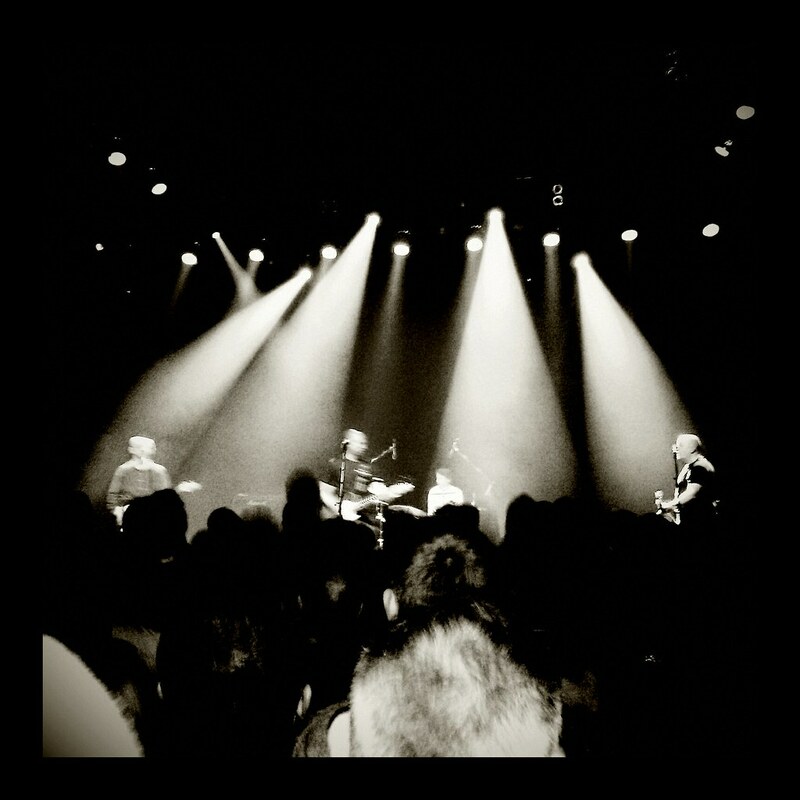 They are truly rock ‘n’ roll, and by that I don’t mean they wear spandex and drive limos into hotel pools; The Fall are as raw as the day they started in 1976, they will never sell out. FANS! ! ! Remember, you are abroad! I’ve a bit more time on my hands now that I’m ‘between jobs’, and I’ve got the old iPod plugged in more too. I was watching the excellent Granada series ‘Madchester – The Sound of the North’ on YouTube last night and it showed Clint Boon being filmed for the Inspiral Carpets’ video of ‘This Is How It Feels’. There’s a nice vintage Berghaus Trango on view here too. I’ve been re-visiting this quintessential Manchester band, stuck away in the nether regions of my iPod collection, after viewing this little gem. They were fantastic, and that arch-bellend Noel Gallagher used to be their roadie – that’s as far as he should have gone in the music business. 1990 – it didn’t get better musically than this year (well maybe 1989 beat it) for me. Memories are made of these. 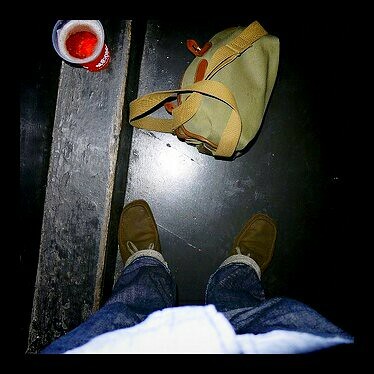 A very good Belgian friend of mine – DG – writes for the rock music webzine albumrock. 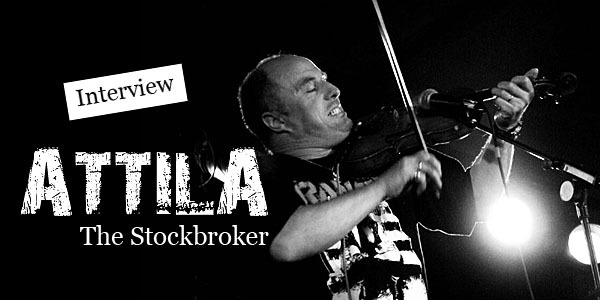 Last month he interviewed our very own Albion legend Attila the Stockbroker (AKA John Baine). 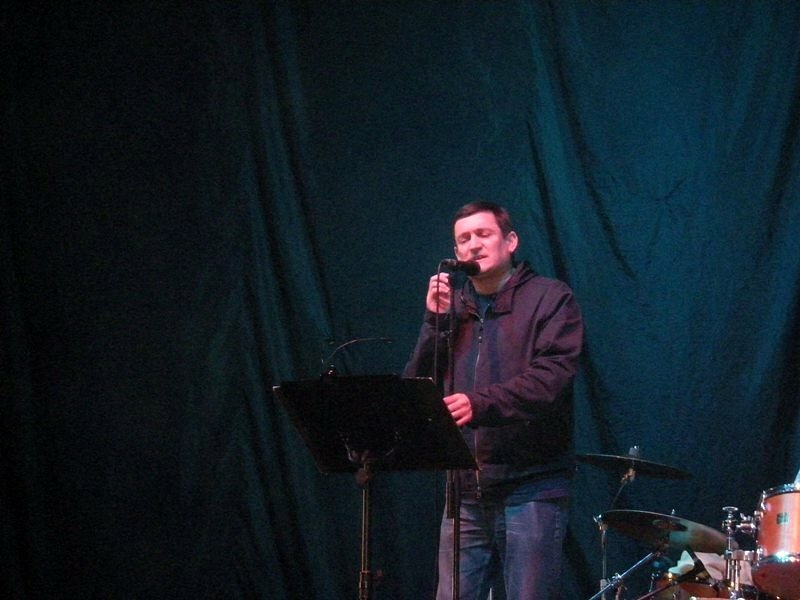 For those of you who aren’t BHAFC fans, Attila is Brighton’s (the city and the football club) home grown renaissance man – punk poet, musician, polemicist, activist (political and for BHAFC), Withdean Stadium announcer, Albion nut, and all round top man. Although not really that well known over here, Attila The Stockbroker, real name John Baine, has been touring all over the UK and Europe since 1980. A modern times punk bard, Attila is a politically involved poet and musician. He is also an astute observer of the world that surrounds him, characterised by his acerbic yet humoristic way of writing. 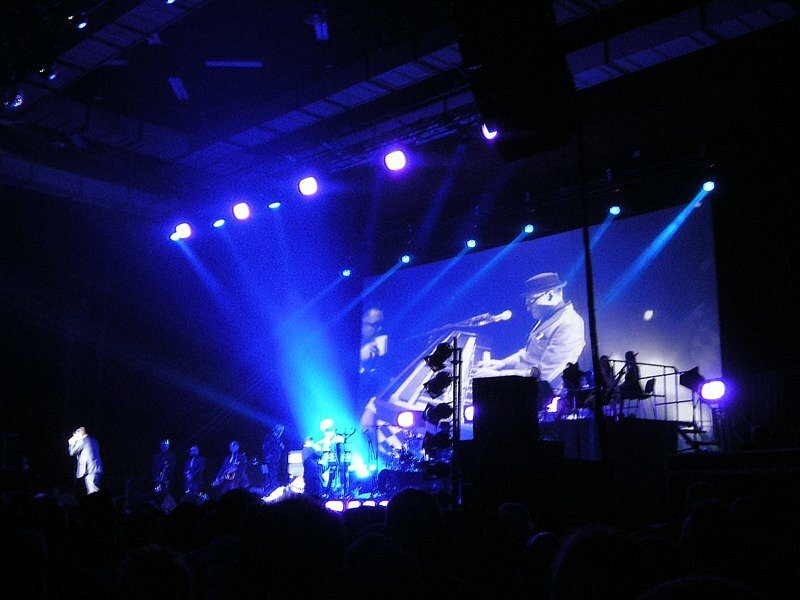 His concerts, on his own or together with his “baroque’n’roll” band Barnstormer, are anything but a long quiet, genteel affair. 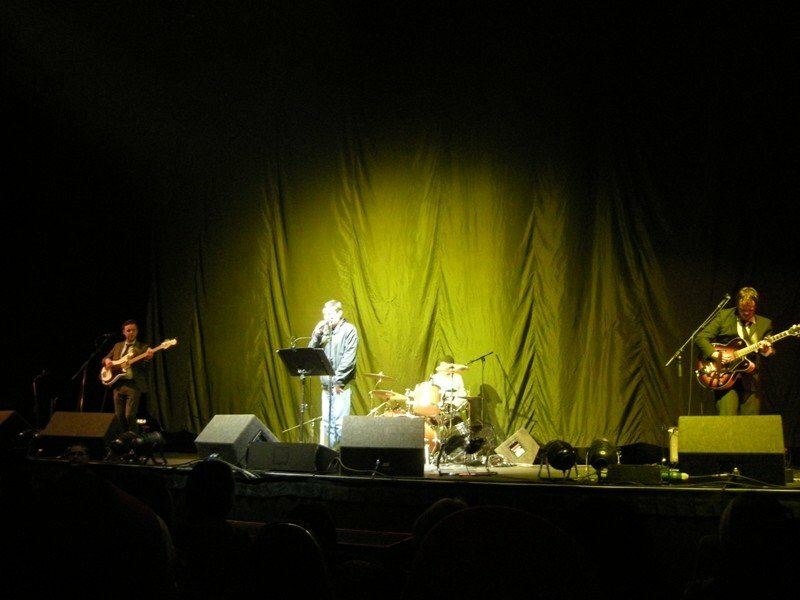 Thirty years, 2,700 gigs in 24 countries, 6 books of poems and over 20 albums later, we met with him in Brussels where he was playing at the Magasin 4 as part of his 30th Anniversary Tour. An excellent opportunity, between Berlin and Brighton, to talk about music and poetry of course, but also about politics, football and the French language. After a first set of gigs in the UK and some dates in Germany and Belgium, how would you say your “30 years of Attila” tour is going so far? Really well. My home town gig in Shoreham was sold out (250 people) which is a good attendance for me, and all the others have been great too. It won’t be so packed everywhere, but everywhere I go – be it England, Wales, Holland or Germany – there is a healthy number of people, who enjoy what I do and have followed me for years. That’s why I am doing it: to celebrate! I am also planning some touring in Australia for next year, with Canada and the U.S.A. other possible plans. 30 years of career, what would you describe as the most important positive aspects such a career has brought to you? The most positive aspect is the opportunity to spread my political and social ideas, without compromise, while at the same time proving that you can have a bloody good laugh and that being a political performer doesn’t mean that you are a po faced, humourless person. My socialism is about celebrating life and celebrating people! On a similar note, I would imagine you’ve been through numerous ups and downs through your career. Have you at some point been tempted to call it quits? I have literally NEVER wanted to do anything else, I have LOVED about 95% of the 2700 or so gigs I have done. I have loved them for the travel, for the performances themselves and for the people I have had the opportunity to meet at these gigs. On the rare occasions when I have had a bad gig, been threatened by Nazis etc I just remember how lucky I am to be doing what I love. It is not just the fact that I love what I do, but the fact that I don’t have to spend my days doing a job I loathe to earn my living. My days are my own! 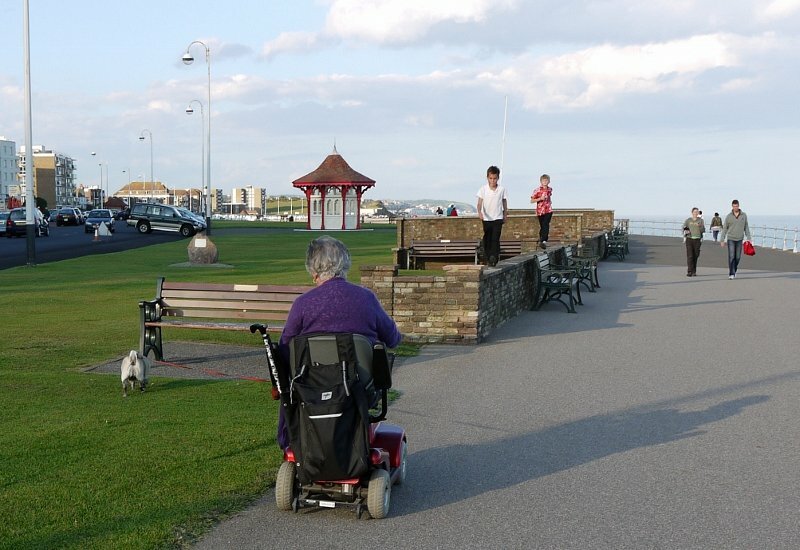 OK, I spend many hours a day in front of the computer organizing stuff, but if I want I can get on my bike, for instance, and go for a 10 mile cycle ride, then come back and carry on……I can! You are playing in Brussels, which is the “capital” of the European Union, what are your views on the current “European construction” process? As the author of “This is Free Europe”, I imagine that you are not satisfied with the way things are going. What would you change if you were suddenly the new man in charge of the EU? You’re only allowed a maximum of three wishes though. Firstly, I would nationalise the banks, jail the bankers responsible for the capitalist crisis, tax the rich massively and use the money to tackle poverty. Then, I would ban all fascist parties. And to finish, I would make public transport so cheap everywhere that people would save huge amounts of money using it rather than driving. I am impressed by how easily you manage to express your feelings in your poetry. I was really impressed by the poem you did for your late mother who suffered from Alzheimers. How easily do words come to you when you write poetry and what’s the kind of feedback you get from audiences when it comes to more personal issues? I have always been lucky enough to have the kind of confident personality where I felt I could talk freely about everything, however difficult. I have always written about what is happening – to me, and in the world – and when this terrible thing started happening to my mother, and my stepfather died, I wrote about it too. Reactions have been fantastic. I have raised nearly £1000 for the Alzheimer’s Society with the pamphlet I have produced, and have had audiences in tears and got a standing ovation from a packed tent at the Beautiful Days Festival in Devon. I think the impact is greater because for the first 25 or so years I wasn’t really writing much personal stuff at all. So when I did it made an even bigger impression. There’s no doubt you’re a living one man operation. Why? Any reasons why you are not currently signed with a record label? I have never deliberately not signed with a label: I had record deals (with Cherry Red, Anagram, Musidisc, Probe Plus) for the first 10 or so years and book publishers (Unwin & Allen, Bloodaxe) up until 1994. As time went by it became obvious to me that these companies were not making enough effort to get the books/CDs in the shops, and that most of the copies being sold were ones I had bought from the companies at an inflated price and sold at my gigs! I realised that I would have much more control (and make more money!) doing the stuff myself, and so I decided to do so. Aren’t you worried about some people not being able to get their hands on your books or your CDs? For the first few years I was doing this, say up until about 1999, of course it was difficult to get my stuff since I didn’t bother with distributors but once the internet got going I put loads of stuff up there. 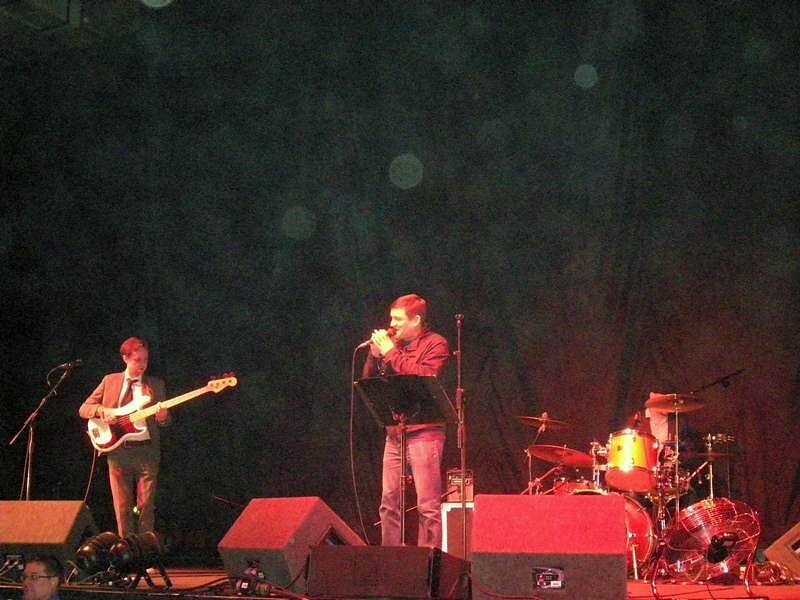 All my songs are on Itunes, and on my website (www.attilathestockbroker.com) and MySpace (www.myspace.com/attilastockbroker). There are online shops where anyone can buy anything. I regularly contribute tracks to compilation albums for good causes, for free. And for my 30th anniversary I have compiled an album of my best songs called ‘Disestablished 1980′ which has just been released by my friend Mike at Mad Butcher Records, and will be available in shops all over[Soft Break]Europe! What are your views on the UK government’s decision, with the Digital Economy Bill, to potentially start hunting illegal downloaders, just like France is already doing? I have always made loads of my stuff available for free download and the most important thing is that people hear it! The Tories are back in power, do you think the coming years might be like the 80s under Thatcher all over again? The government has obviously, and because of its class nature, decided to make ordinary people pay for a crisis called by bankers. The Labour Party will move to the left, a bit, but not enough! Lots of people will be very angry: the challenge will be to get them ORGANISED! You are a huge football fan, what attracted you to go to football in the first place? I have always been a fan since my dad took me when I was six. And how did you end up at the forefront of the fans’ movement that followed the sale of the Goldstone ground? (ED: in the second half of the 90s, the owner of the club, an entrepreneur from the North of England, decided to sell the club’s stadium without any viable back-up solution in place. This decision was followed by a huge contestation movement joined by fans, members of the local council, local citizens’ organizations, celebrities such as Fatboy Slim and inhabitants. 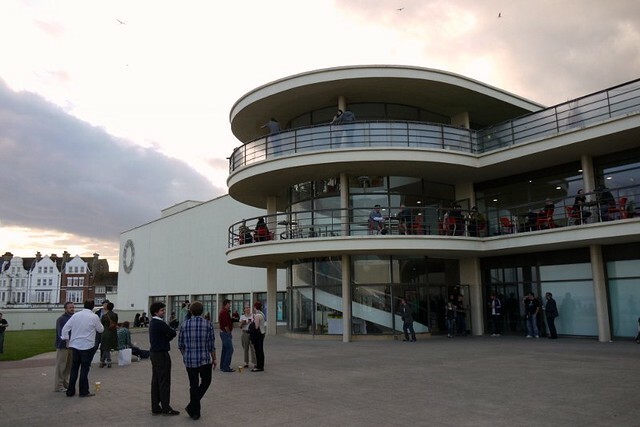 Although a temporary solution was found, it is only next year – 15 years after it all started – that BHAFC will finally move to its new stadium at Falmer, in the city’s suburbs). As an anti capitalist activist it was obvious that when my beloved club was being destroyed by rapacious property speculators and moneymen I would get involved! I maintain to this day that the successful fight to save BHAFC is one of the things I have been involved in as a leftist activist that I am most proud of! A lot of people perceive modern football as a rotten apple because of all the money involved. Should BHAFC get promoted to the EPL, would you be worried about such a scenario happening all over again? As regards the EPL and unsuitable people getting involved, we’ll have to wait and see. I am fairly confident that we can deal with that situation should it arise – as long as the majority of active fans think it is a problem, I think the club will listen, they know how organised and determined we are! Following all this, you became the poet in residence at BHAFC, how does that work? Reactions to my poetry are very mixed, but most people, even people who hate poetry, agree that my ‘Goldstone Ghosts’ poem is one which strikes a chord. As the DJ at the stadium I have to tread a fine line between playing music which is good and music which the majority of people can relate to in some way. Obviously I would like to have the Clash, Redskins, Rancid, King Blues and lots of reggae every week – and all of these get played every now and then – but mixed in with other obvious newer football anthem stuff like the Kaiser Chiefs, Dandy Warhols and the likes. There are often people having a go at the music on our message board but most people seem to like it. You were wearing a St Pauli sweatshirt on stage tonight. That’s another football club where sports and politics are sometimes mixed. How does it compare with BHAFC? The St Pauli/Brighton comparison has been made many times but there isn’t one. St Pauli were a club with a 4000 fan base who in the late 80s started to attract a radical left crowd from all over Germany and abroad – not just Hamburg – and now sell out a 20,000 stadium. We are a local club with a 30,000 potential fan base, just normal fans, no politics involved, most of whom do not go much at the moment, but will come back in droves when we go into the new stadium! And in terms of the financial problems at St Pauli, despite them being more radical than Brighton we have had a far better idea of the problems here than the St Pauli fans were ever allowed! Back to music and poetry, can we expect some dates in France any time soon? Quite simple – I love France and the French language, but there seem to be very few people who are interested in what I do, unlike the German speaking countries, Scandinavia, Belgium and Holland, where I play lots. If there are people out there who would like to organise gigs, I’ll come! You speak fluent French. Have you ever been tempted to write poetry in French? I did it once. 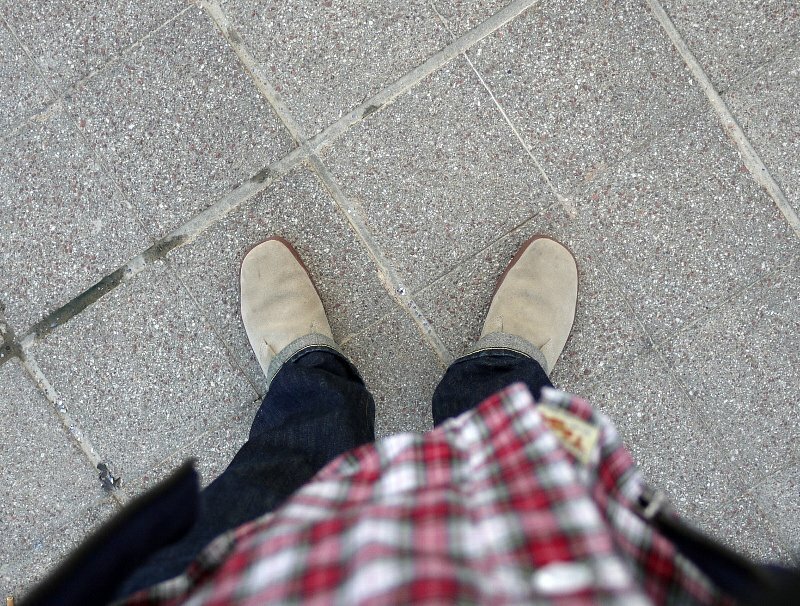 I wrote a translation of my song ‘Libyan Students From Hell’, but that’s all. It’s a completely different tradition. I do think everyone should write in their mother tongue, which is why I get annoyed with mainland European bands who think they sing in ‘English’ but that re in fact just mumbling something akin to “yoghurt”. You’re better using your native language to express yourself. For our readers who may not be familiar with your music and poetry, which one of your books/CD would you recommend to start with? For books, I would recommend “My Poetic Licence, which is available from my website. And for CDs, probably “Disestablished 1980”, available from www.madbutcher.de, which we have already talked about. It’s a “best of” covering most of my career. Last but not least, what are your plans for 2011, should we expect any new releases next year? Loads more gigs, I intend to start touring the world again now that my mother and stepfather have both passed away. Having released my last poetry book in 2008 and a CD this year I don’t think there will be any new ones next year, but we’ll see! I’m a child of the 80s, and two of my favourite things from that glorious decade are playing in Brighton together this december. 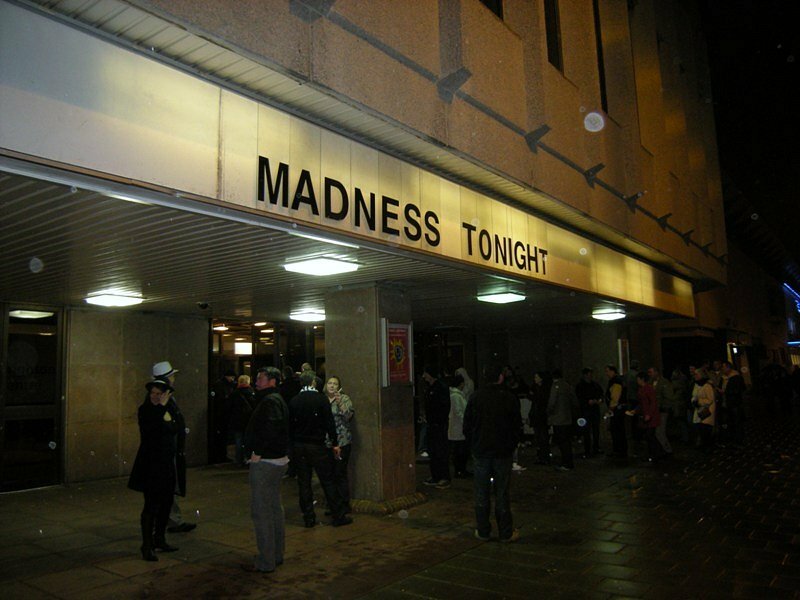 Madness need no introduction, I’ve been a Nutty Boy fan ever since Suggs and co bopped their crew cuts to ‘The Prince’ on TOTP back in 1979 (see above). 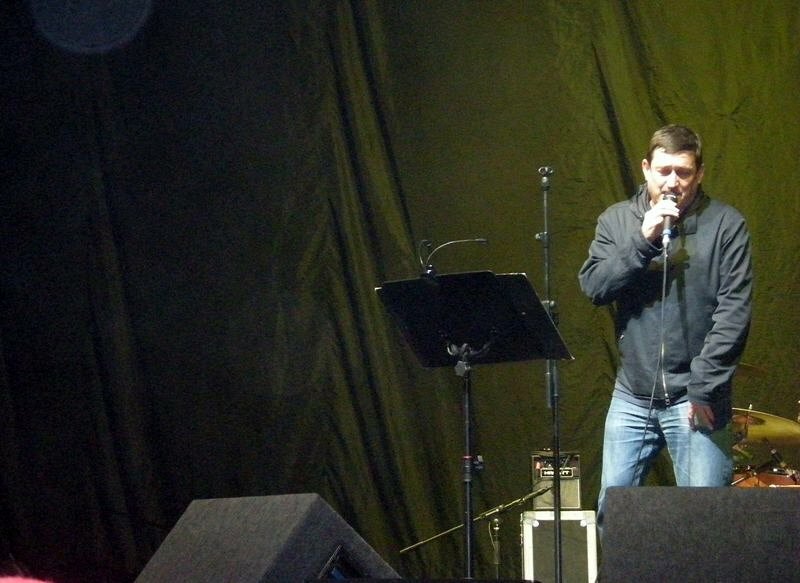 Paul Heaton, the Stone Island loving frontman of the incomparable Housemartins, is on stage with them, he also has a new album out on 13th September. With two of my favourite musical acts under one roof together, the 13th December 2010 is going to be a night to remember. A guilty pleasure on this Monday’s playlist, ‘We Can’t Be Stopped’ by the Geto Boys. Forget your Fiddy Cent and all the other pseudo-rappers about nowadays, these boys from unfashionable Houston, Texas were the real deal, from a time when Rap was the real angry voice of young black America. Along with LA’s NWA and New York’s Public Enemy, the Geto Boys had a hard-hitting message, and of the three were by far the most raw, and in my opinion, the most memorable. The fact they were from the heart of redneck Texas gave them a ring of authenticity that the other more popular acts – from the two cosmopolitan US coasts – could never match. I got into them in 1993 when I picked up a copy of their ‘Till Death Do Us Part’ LP. But the earlier tune here is probably their greatest, along with ‘G.E.T.O.’ (which I couldn’t find on YouTube).